Sustainable Developmental Goal 5 (SDG 5) aims to achieve gender equality and empower all women and girls to ensure inclusive and equitable quality education and promote lifelong learning opportunities for all. The data represents the age-standardised prevalence of women aged 15 years and older who experienced physical or sexual violence by an intimate partner in the last 12 months in percentage terms (past – unscaled). The Commonwealth average for domestic violence faced by women declined from 36.19% in 1990 to 31.81% in 2016. 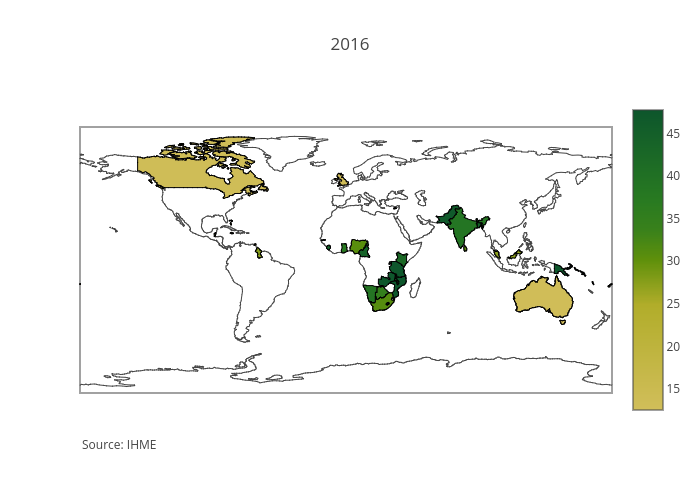 As of 2016, 22 Commonwealth nations were above the Commonwealth average of 31.81%. According to the IHME data (Institute for Health Metrics and Evaluation), Kiribati had the highest share of women facing domestic violence at 47.75% while Singapore had the lowest at 12.53% in 2016. Note: No data available for St. Kitts and Nevis, Nauru, New Zealand, Swaziland, Tuvalu and Uganda.